A lightweight raincover perfect for unexpected showers. So light in fact that you'll be able to leave it in your camera bag wherever you go. 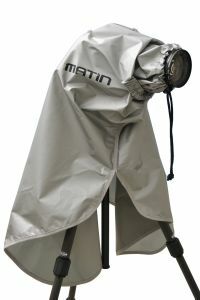 This silver-coloured raincover is incredibly lightweight weighing only 80g. It features an elasticated sleeve to incorporate the lens, which can be tightened further with a draw cord for a snug, watertight fit. The standard size fits all EOS cameras fitted with up to 300mm lens.